I know the expenses scandal is a long time ago, but since I didn’t hear anybody making the point I wanted to make at the time, here is my take on it. In particular, I am interested here in the use of the word ‘conscience’, and the closely-related (but different) word ‘conscious’. Most of the discussion of the expenses scandal was about ‘the system’. The system of reclaiming expenses and what was allowed and what wasn’t was described as broken, confusing and unfit for purpose. MPs queued up to say how dreadful it was: I even heard an MP on The World at One explaining that it was perfectly reasonable for people to put in claims for all manner of things, including things that they were fairly sure weren’t allowed, on the grounds that these items would simply be turned down and no harm done. Nevermind that this is a tremendous waste of everyone’s time, or that it implies that MPs are unable to understand (or even acquaint themselves with) the relevant rules, or that it removes the burden of making difficult decisions from people who have supposedly been elected on the basis that they are suitable people to make a whole load of difficult decisions on behalf of their constituents. In other words, it was not necessary for MPs to be conscious of what the rules were: there was a whole department to do this for them, and to apply said rules, and to send them the money deemed to be theirs by right. Clearly, the system for claiming expenses was inadequate, but that’s not the point. The point is that this shouldn’t matter. If one works with an expenses system (or indeed any other system) in which the rules are either unclear or applied inconsistently, then the rules do not regulate one’s behaviour in a meaningful way. The only thing regulating one’s behaviour is one’s conscience. It is simply not good enough to say ‘the rules allowed me to claim for a duck house, so I claimed for a duck house’ i.e. the rules alone determine what I take to be morally acceptable. Do you really mean to say that you, an over-educated, highly qualified member of parliament, are not capable of deciding for yourself whether the taxpayer should pay for your pets to have housing appropriate to their needs? Moat-cleaning, cot-furnishing and the accommodation of waterfowl aside, there was of course also the case of Eliot Morley, who reclaimed mortgage payments on a mortgage he knew he had already paid off. What these by now well-rehearsed examples amount to is doing whatever you like as a default position. If you get caught out, then (and only then) you feel bad about it. If you don’t get caught, this allows you to believe that what you have been doing is morally acceptable, and indeed has in some vague way been sanctioned by somebody or other. Parallel lines of pseudo-logic can be seen in the ‘she was asking for it by wearing/drinking/saying x’ defence of rapists; attempts to declare the Iraq war ‘illegal’ when surely ‘immoral’ should have been more than enough; ‘I wore red socks to school and the teachers didn’t say anything, so they must be part of the uniform now’ (one of my dimmer students); and a former burglar I heard on PM recently, saying that the people he had robbed ‘deserved it’ because he hadn’t found breaking into their house sufficiently difficult. The vast majority of staff at the University Which Continues To Have No Name So That I Don’t Get Sued massively under-claim for their expenses, through embarrassment at processing a 67p receipt for a packet of biscuits (say); through forgetting to keep a receipt in the first place; through not really knowing what the rules are about things such as mileage or meals with guest speakers; or through actual principles about what they feel it is reasonable to charge to the university. However, one particular colleague used to claim for absolutely everything he could think of (lets call him Senior Lecturer K. He always insisted on being referred to as Professor, despite being no such thing, for reasons that I won’t go into here because THEY DON’T EXIST). Books of stamps (I wrote ‘use the franking machine next time’ on so many post-it notes that I might as well have had a stamp made, carved from purest irony) and packets of drawing pins (Me, again via post-it: ‘is there something wrong with the drawing-pins in the stationery cupboard?’; Senior Lecturer K: ‘what stationery cupboard?’) were the inexpensive end of the wedge. At the other end was a £45 fax to Nigeria, and his inability to apply any sense of moral moderation to the rule that allowed staff to claim up to £5 per meal for any meal purchased while on university business for which they were not able to produce a receipt. Every single expense claim of his that involved travel would always include three ‘meals’ per day, each of which had apparently cost him precisely £5, and none of which he could back up with a receipt. This often added several hundred pounds to each claim. Senior Lecturer K defended this exactly as above: the rules say this is OK. If it were up to me, there would be no rules whatsoever about what could be claimed, by both MPs and members of academic staff. The only stipulation would be that *everything* they claimed appeared prominently on a website with their name and photograph on it, below the statement ‘I think somebody else should pay for this.’ We could call it www.jiminycricket.org.uk. This is from a post on the LRB blog by the brilliant John Lanchester. He is also the author of two of the best new books I have read in a long time: Mr Phillips and The Debt to Pleasure. I am ashamed to admit that I have at least one more of his books in the library which passes for my house, which I have so far failed to read. I’m sure it’s magnificent, though. 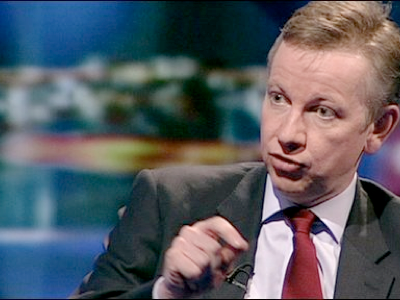 Image http://news.bbc.co.uk/2/hi/programmes/newsnight/8620149.stm Shadow education secretary Michael Gove talks to Newsnight's Jeremy Paxman about the measures outlined in the Conservative Party's election manifesto, in particular the plan to allow parents and teachers to set up their own schools. Broadcast on Tuesday 14 April 2010.